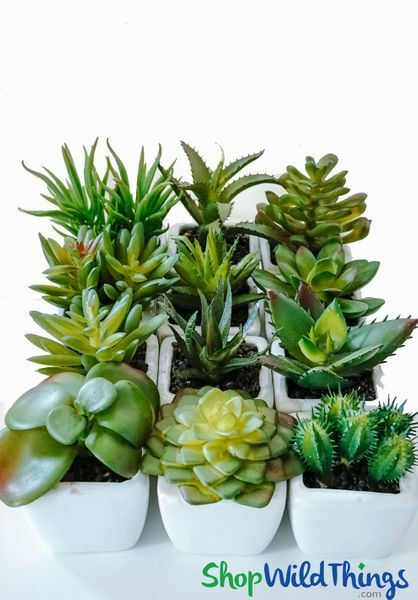 Home > Floral Decor > Succulent Picks & Potted Sets > Succulents in Pots - 12 Assorted Mini Faux Plants - 2" x 3-4"
What's not to love? Adorable,fun and forever green! This fabulous Set of 12 Artificial Succulents already potted in 2" White Ceramic Vases are a marvelous addition to even the smallest of areas! Plants, greenery and florals add so much life and vitality and here"s 12 doses of essential daily energy to brighten up your day! Plants are naturally calming which lowers our stress level and allows us to maintain a healthy, peaceful outlook. 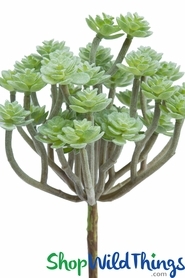 These succulents are so realistic looking in color and texture and the variety of shapes is visually appealing. The heights range from 3" tall to 4" tall. Some have slender or spikey leaves and some have thick fleshy leaves. Some are all green and some have tinges of burgundy. Each succulent is �potted" in tiny dark brown rocks which are glued in and the white ceramic vase is a 2" square. If they get knocked over, no big deal! From the patio to the kitchen to the window sill and tub, these luscious little desert treasures will enhance every nook and cranny but they also make an incredibly carefree and easy party favor! Garden parties or nature themed events will have your guests admiring your caring, thoughtful gift that they can use all year round and not have to tend to! For weddings, these make the perfect, effortless, trouble-free centerpiece! 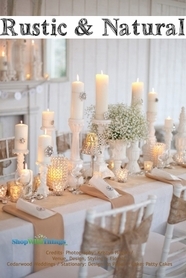 Group several on Centerpiece Mirrors or use them to encircle Flameless LED Candles. You could even attach a ribbon to color coordinate with your event. Clean and Simple! Personalize by painting on individual names, symbols or designs, add your company name or brand logo. What a delightful and clever memento! Create a rustic tablescape setting by combining Driftwood Garlands with these colorful, no-fuss plants!